Pre-heat oven to 450° F (220° C). Sift flour, salt and pepper, and 1/2 parmesan together in one container. Sift cornmeal, bread crumbs, basil and other 1/2 of parmesan together in another container. Dip tilapia into flour mixture, then into egg whites, then into cornmeal mixture. 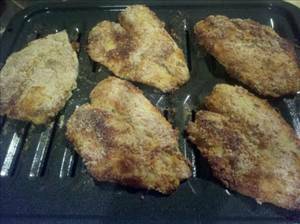 Lay fillets flat on baking sheet or broiling pan sprayed with non-stick cooking spray. Place in oven and bake for approximately 20 minutes. 346 members have added this recipe to their cookbook. This is delicious, but I think the weight of the tilapia is not right... It only says 6 oz of tilapia for 5 servings. Crisps up nicely, though and is flavorful. sounds good to me, I will have to try. pretty good liked the breading on it. Tried to bread fish before but hadn't been successful. There are 182 calories in 1 serving of Parmesan Crusted Oven-baked Tilapia. Calorie break-down: 13% fat, 58% carbs, 29% protein.